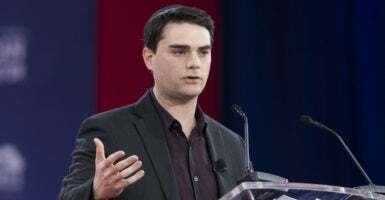 A private college in Minnesota refused to allow conservative author and commentator Ben Shapiro to speak on the anniversary of a hate crime hoax at the school. The Turning Point USA chapter at St. Olaf College attempted to invite Shapiro to speak April 23, but the campus administration shut down the proposal, citing the date as a time for “building unity,” The College Fix reported. Our campus is still healing from that experience. One year after the unrest, I would like this to be a time where our community is focused on building unity. For these reasons, having Mr. Shapiro come during the last week of April is counterproductive to that goal, and inappropriate. Kathryn Hinderaker, president of the St. Olaf Turning Point chapter, said the group had been in the process of planning the Shapiro visit since November and he was available to speak only on April 23. Administrators turned down the visit in February, days before Turning Point had to submit a payment to finalize the speech. The college elaborated on its decision in a Wednesday email to The College Fix. “We have never stated or implied a connection between racism and conservatism,” a spokeswoman said, denying that, when reviewing the speaking proposal in mid-February, April 23 was Shapiro’s last available date in 2018. “We hope that the anniversary of last year will be an opportunity to bring the campus closer together and not to divide us further apart,” she said. Rob Shimshock is a reporter for The Daily Caller News Foundation.